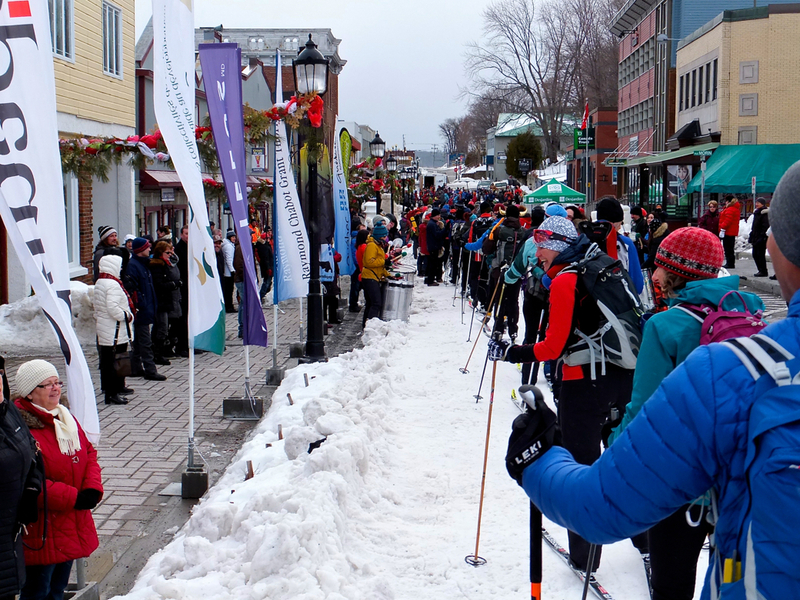 Like most of the French-Canadians on this popular winter tour of Québec’s Gaspé Peninsula, the woman in front of me is petite, fit and expertly equipped. As she gracefully makes her way down the long slope ahead, her upper body rises and falls in the hypnotic kick, double-pole rhythm of an experienced cross-country skier. A visiting Anglophone from Alberta, I am a hundred yards behind her and about 50 pounds heavier. Our downhill trail is narrow—a single lane with icy parallel tracks slashed through thick woods (so snow plowing isn’t an option)—and the laws of physics are rapidly bearing me down to a high-speed and uninvited embrace. The inevitable smash would undo several days of “entente cordiale” and change my status on this trip from curious Westerner to blundering party-crasher. East-West relations would sustain an appalling blow, pipelines would be cancelled and maple syrup withheld. It was all too terrible to contemplate. To avoid the crash, I hurl myself off the trail and into the outstretched branches of a dense and relatively forgiving dogwood. After gathering my senses, I collect my scattered gear and humbly crawl back onto the trail just as the striking Emmanuel Bilodeau comes skiing down the track towards me. He collects his poles in one hand, jams them under a bent knee and expertly controls his descent by forcing them deep into the snow beside the trail. Silhouetted against the grey sky and falling snow, his lean, Gallic features make him look like a character in the Hollywood production, The Revenant. In fact, Bilodeau was a character in The Revenant—also serving as a French language advisor to Leonardo DiCaprio’s production team. He laughs to see me picking burrs off my toque, and calls out, “Aux grands maux, les grands remèdes!” (Desperate times, desperate measures). And not for the first time on this adventure, I wish I had paid more attention in high-school French class. Bilodeau is one of several French-Canadian celebrities whose presence makes the Traversée de la Gaspésie, more commonly referred to as the TDLG, an adventure in Québécois winter culture. 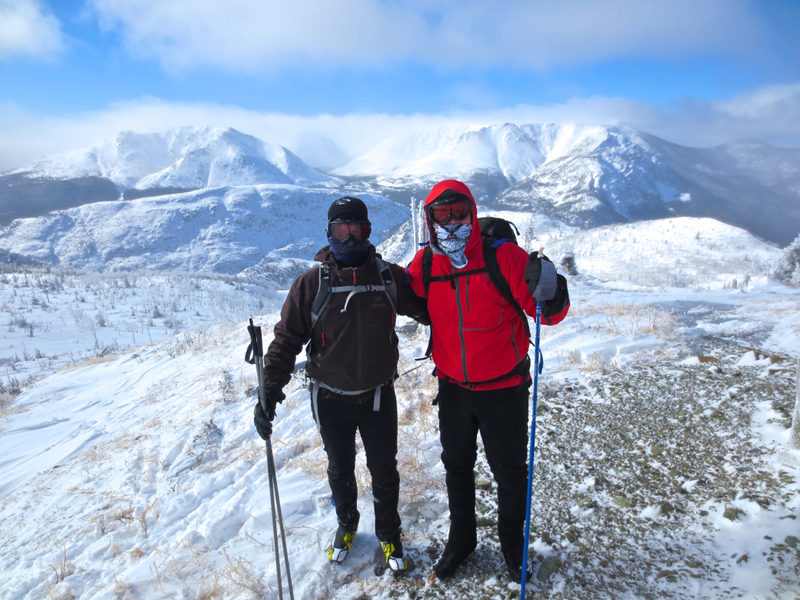 First organized in 2003, the 200 kilometre-plus ski tour takes participants through the impressive Chic-Choc Mountains located in the heart of Gaspésie National Park, which boasts over 190 kilometres of marked trails and 17 warming huts for backcountry skiers. 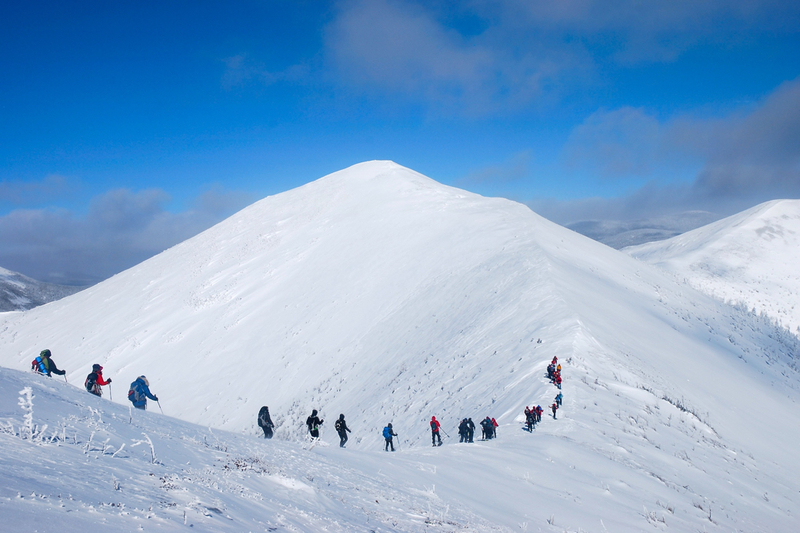 With peaks that soar to 4,000 feet and collect more than 20 feet of snow a year, participants can count on steep terrain and breath-catching, expansive vistas. 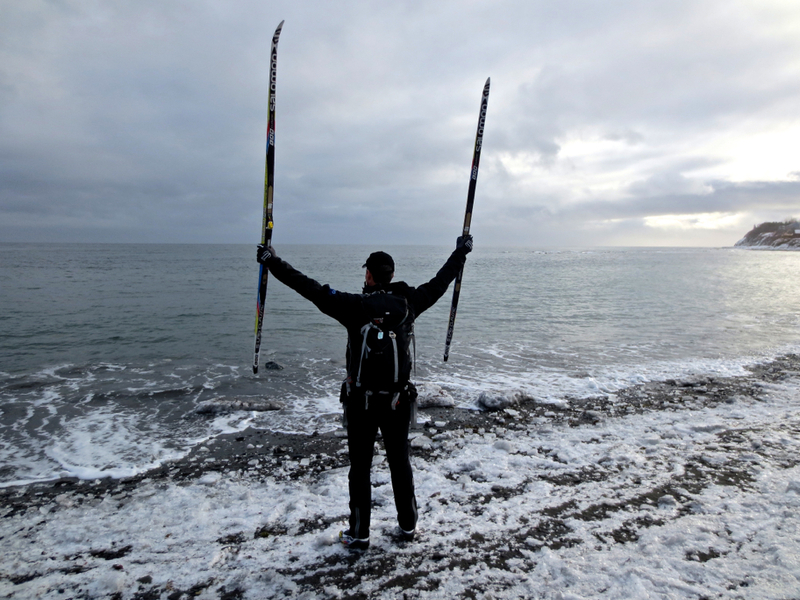 In its early days, skiers moved point to point as they crossed the Gaspé. More recently, the week-long cultural and sports event, which has expanded to include snowshoers, has participants spending a few days at a time in one location—travelling to and from their accommodations by bus to trails that volunteers groom expressly for the event. There’s a different route every year, and distances are considerable, with skiers travelling up to an ambitious 36 kilometres a day. Once you start, you’re committed, and be prepared to climb. The trip I experience is not for beginners, nor for the out of shape. When I join the TDLG in February 2016, there are 220 participants, mostly skiers. The youngest is 16. There are at least two men in their mid-70s and women slightly outnumber men. Fully 90 per cent come from Québec—a statistic unilingual English speakers need to appreciate. The TDLG is very much a French-Canadian event. Everything takes place in French—from morning briefings to evening lectures and entertainment. Recognizing the handful of English speakers present, organizers take pains to keep non-Francophones in the loop. We’re not forgotten or ignored, but this clearly isn’t our party. It’s a bit like being a chicken at a penguin convention; you share some common traits and the differences are fun to explore, but you’re going to have to make an effort to fit in. 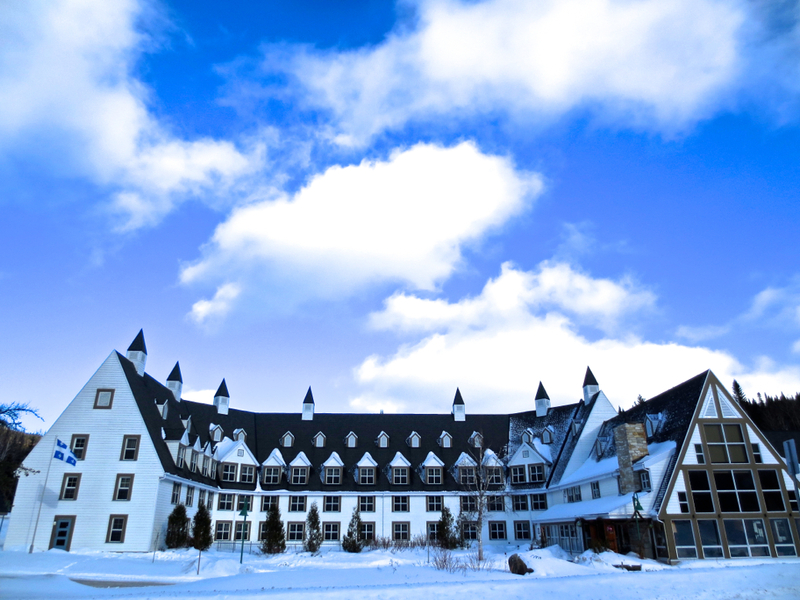 Speaking of fun, the party begins the moment we step off the bus in Gaspésie National Park at the picturesque Gîte du Mont-Albert—a gorgeous 4-star hotel (featuring 60 rooms and 24 cabins) with classic lines that emerges like an ocean liner from a sea of boreal forest. When I arrive, it’s snowing hard. A drink is pressed into my hands. I’m greeted with a hug by a woman dressed as a giant white rabbit and we promenade down a reception line of dancing drummers. If this sounds like the counterfeit bonhomie of a Club-Med reception, it isn’t. The enthusiasm is real, the music wildly improvised and the costumes everything but skimpy. We learn quickly that self-sufficiency is the rule on the TDLG, so we pick up our own bags, get squared away in our hotel rooms and carry our skis to the nearby storage and waxing area. With everyone staying in one place, logistics are simplified and participants can dine, dance, flirt and carry-on at will. Claudine Roy, our gregarious master of ceremonies, welcomes participants with a rousing speech. She introduces the musicians, celebrities and guides who will play key roles during the week and she passes out maps and instructions. At least, this is what I think is going on. Honestly, I don’t understand a word of it, but another TDLG first-timer from Montréal recognizes my bewilderment and graciously volunteers to translate, boiling down a 20-minute speech to a few lines of English. “I know it sounded like a lot,” she tells me. “We French like to talk. She’s really funny, but essentially she’s saying, ‘Prepare for a great week!’” Canapés appear, drinks flow and the band fires up. Had I known what kind of day was to follow, I’d have gone straight to bed. Typically, breakfasts are at 6:30 a.m., the day’s route is presented and we are all on the bus—skis waxed and ready to roll by 8 a.m.
Our first day on the trail is a challenging 35-kilometre loop in too-warm conditions—this being an El Niño year. Finding the right kick wax to negotiate the initial five-kilometre uphill climb is perplexing, and I learn a large vocabulary of French curses listening to fellow skiers try exotic combinations of purple, red and klister waxes in a desperate search for something that will stick to the wet snow. Conditions improve considerably as we climb into colder air, but I find my classic nordic skis (long and thin) a poor match for the backcountry conditions of the 20 kilometres that follow. Those with shorter, wider, metal-edged skis manage better, particularly on the long downhills that follow where we have to hold a controlled snow plow for kilometers at a time. Take note: skins, presented as a nice-to-have in the packing list, are invaluable in this terrain. Because we all start from the buses at roughly the same time every morning, we turn into a snorting, bunched-up, ready-to-stampede herd for the first 30 minutes. Patience and good humour are much-needed requisites until the group spreads out and individuals find their own pace and rhythm. By noon on most days, there are long stretches with no one in sight ahead or behind. About every 10 kilometres, volunteers are waiting with snowmobiles pulling sleds of hot soup and snacks. About half way through the expedition, when I am feeling a bit done-in, one of these volunteers asks me what I want to drink as I hand over an empty mug. Feeling bloody-minded, I ask for a gin and tonic. He grins, and hands me a lukewarm Gatorade. The next day, when I encounter the same guy, a real gin & tonic is waiting. I don’t typically recommend booze halfway through a long slog, but I sure appreciate the gesture. Local volunteers are the bedrock of the event. They’re kept busy track-setting trails, fixing broken bindings and hauling everything from mileage markers to tired skiers. At the end of each day, they sweep the entire length of the trail and carry out those who can’t quite reach the end before dark. Ever-changing conditions complicate their jobs. On one particularly cold day, sticky wax is scraped away and replaced with the hard green variety, and the majority of us bundle up in every piece of winter clothing we own. Even in the icy blasts, the climb into the alpine region of Mont Ernest-Laforce—providing spectacular views of the surrounding mountains and affording long stretches of virgin snow as we descend through forests of birch and spruce— is one of our best days. Elusive caribou dot the crest of the mountain and fresh lynx tracks crisscross the trail. The cold is no barrier to the Québécois cultural community. 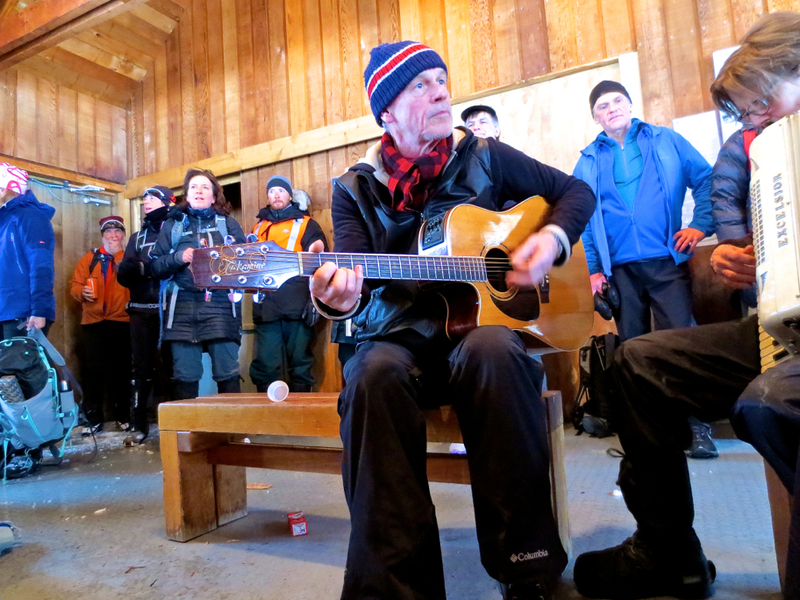 Almost every day, the Zappalaches trio, equipped with guitars, banjo and accordion, perform in remote warming cabins along our route. They are a welcome break from skiing, and strategically timed to inject much-needed mid-afternoon energy into fatigued legs. I come away with a whole new interest in toe-tapping French-Canadian folk songs. When we reach the shore of the Saint Lawrence River, interpretive dancers, dressed as 16th-century nuns, perform right on the frozen shore. It is one of the most intriguing spectacles I’ve ever come across. I dare you to find ice-dancing nuns on any other winter adventure vacation. Evenings are similarly exotic. Along with dancing and live music, actress Sophie Faucher presents poetry readings. Arctic explorer Sébastian Lapierre lectures on his exploits. And there are skits and daily highlight films. Damn but I long to speak the language! In frustration, I involuntarily adopt a debauched French accent. It doesn’t help but at least it conveys an aspiration to bilingualism. In my mind, I sound like Maurice Chevalier, but the reality is closer to Inspector Clouseau and it doesn’t win me any friends. What I do learn is that the universal language of music is the real icebreaker. One evening my brother (who accompanied me on the trip and who plays in a band) boldly joins the ensemble onstage and belts out the Old Crow Medicine Show tune “Wagon Wheel,” one of his band’s biggest crowd pleasers. 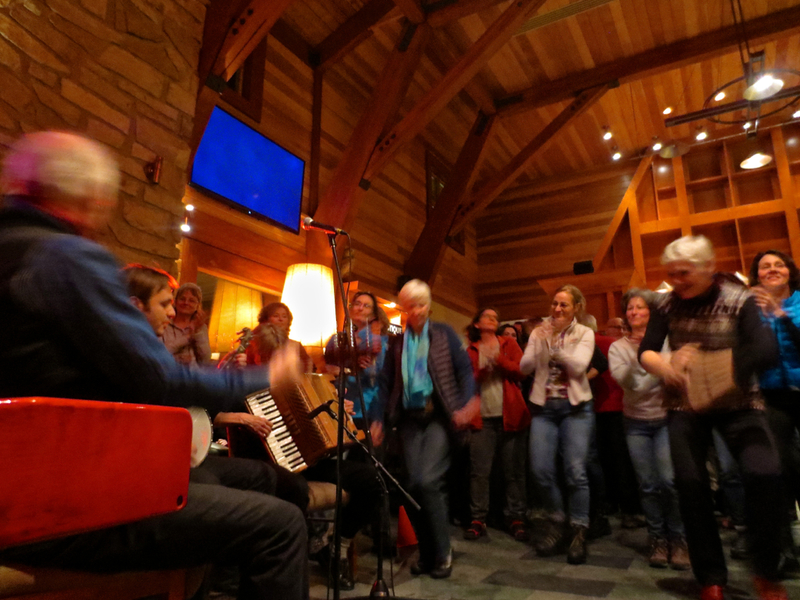 The gesture electrifies the room and a hundred tired, wet skiers are suddenly singing along. Any lingering concerns I have about about non-Québécois joining this expedition disappear. From this generous group of people, acceptance comes not from speaking the language but from appreciating their geography, art, literature and music. It takes some work, but by simply learning the words to the “Chaussez Vos Skis” (the TDLG theme song printed in the program), Anglophones like me can sing along with Sylvie Gallant and her ever-present accordion. In return, she delights in trying her hand at some English tunes and the result is a wonderful cultural mash-up. French Canadians have a long history of making the best of winter. In December 1606, Samuel de Champlain, the “father of New France,” resisted the gloom of the long season by establishing the “Order of Good Cheer” amongst early settlers. On our final day, we ski through Forillon National Park right to the tip of the Gaspé Peninsula and end up skiing into the center of Gaspé’s townsite. We ski past a Tim Hortons, past the Petro-Canada station and down the main drag lined with columns of drummers, flags and hundreds of welcoming locals. Organizer Claudine Roy calls the tour “an adventure in the human heart.” I now understand what she means. Editor’s note: Jeff Gray was a guest of Tourism Quebec and TDLG organizers in 2016. His story was not reviewed or edited before publication. The next TDLG event takes place January 21-29, 2017. As part of Montreal’s upcoming 375th birthday, participants will travel by ship along the St. Lawrence River, stopping along the way for daily excursions. Many thanks to our friends in tourism for their support, as well as the comfortable L’Auberge le Pomerol in Montreal and Hotel Plante in Gaspé. Wonderful story. I felt I was there with the feeling, the weather, the sweat, the music and…. the people. for your luck, but you WERE lucky guys. I really enjoyed reading this article. It made me laugh out loud a few times! I think I would love to try this treck and it’s now in my “bucket list”!